Everyone loves the Ecology articles in Kobold Quarterly magazine; they're a look at things from the monstrous side of the fence, with nasty DM tricks and great story elements to inspire DMs to greatness. But we can only publish one in each issue.... Until now. KOBOLD Ecologies is a massive book of monster love. It heaps on a pile of new ecologies, AND it revises, corrects, and expands all Ecologies from the first two years. 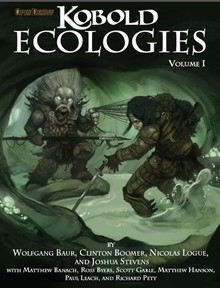 Not just any new ecologies, either: these are written by some of the best, like Wolfgang Baur, Nicolas Logue, and RPG Superstar finalist Clinton Boomer (you've seen his D&D PSA on YouTube, right?). Pick it up today, and wreak some monster mayhem tonight!